Rue du Gros-Horloge and Cathedrale Notre-Dame de Rouen are good opportunities to explore the local culture. Head to Champagne Sourdet-Diot and Marche Saint-Flaivefor plenty of shopping. 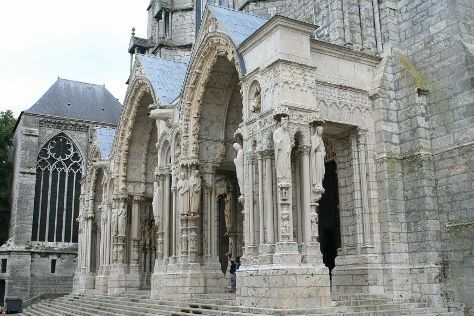 Change things up with these side-trips from Paris: L’Atelier de Leo (in Evreux), Cimetiere Saint-Sever (in Le Petit Quevilly) and Chartres Cathedral (in Chartres). There's much more to do: explore the historical opulence of Chateau de Fontainebleau, take in the spiritual surroundings of Orléans Cathedral, take in the exciting artwork at Artsenal, and get a taste of the local shopping with Galleria Continua. For ratings, other places to visit, more things to do, and more tourist information, use the Paris road trip website . If you are flying in from United States, the closest major airports are Paris-Orly Airport, Charles de Gaulle International Airport and Paris Beauvais Tillé Airport. Expect a daytime high around 64°F in May, and nighttime lows around 49°F. Cap off your sightseeing on the 12th (Wed) early enough to travel back home.